Synopsis: The corrupt Lord Ambrose D’Arcy (Michael Gough) steals the life’s work of the poor composer Professor L. Petrie. The 1962 version of The Phantom of the Opera is a reasonably entertaining movie that suffers from some erratic pacing – it all but grinds to a halt during a lengthy ‘Joan of Arc’ opera sequence near its climax – and some insipid performances from the young leads, Edward de Souza and Heather Sears. Not being familiar with Gaston Laroux’s original story, I can’t say how close this movie is to it, but I was surprised that the phantom became a tragi-heroic figure by the end of the story – such a development seemed to negate a lot that happened before the transformation. The production values are what you’d expect of an early-Sixties Hammer flick (fairly high) and create quite a nice atmosphere in its recreation of Victorian London. 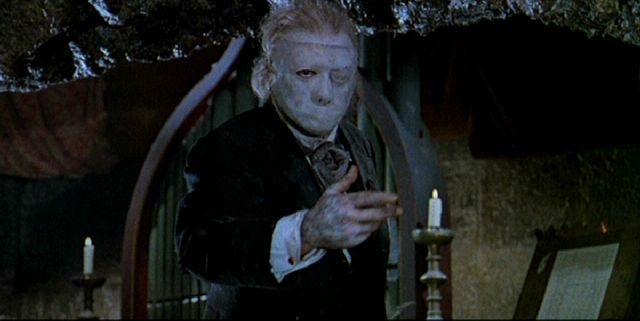 For me, though, there are two highlights to this version of The Phantom of the Opera: the wonderfully slimy performance of Michael Gough (sounding like a dead ringer for John Hurt), and the Opera House’s cleaning ladies – heard off-screen initially they sound just like the Monty Python gang doing their slovenly housewives’ stint.